Frida Kahlo, born in Mexico in 1907, is Mexico’s most exalted woman artist. As a teenager, she suffered a severe injury in a streetcar accident nearly severing her spine. 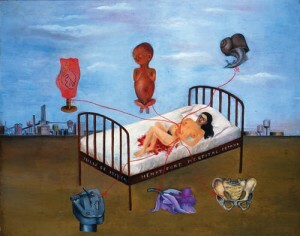 Confined to her bed for many months, Frida began painting while lying on her back. Chronic pain stayed with her throughout her life. 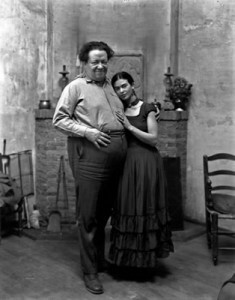 Frida, 22, fell passionately in love with and married Mexico’s famous artist, the portly Diego Rivera, 42. Shortly after the marriage, Diego, chronically unfaithful, began affairs with other women. Frida suffered two miscarriages which inspired her heartbreaking masterpieces, graphic/symbolic paintings of emotional and physical pain…paintings that exalt the ability of women to endure truth, reality, cruelty and suffering. Frida’s fame grew. She is considered to be the first surrealist painter and was the first Mexican woman artist to be represented in a major European institution, The Louvre, Paris. Frida died at age 47. Two meteors streaking across the sky, each beset by his and her own demons; where their paths crossed …. fireworks. Love the blog. Thank you. The first Surrealist artist? What about Max Ernst? Here’s what the Metropolitan Museum has to say: “The visual artists who first worked with Surrealist techniques and imagery were the German Max Ernst (1891–1976), the Frenchman André Masson (1896–1987)…” Maybe she was the “unofficial” first and Ernst was the first to have an “official” membership in the “club,” however that was defined by the art establishment at the time. You very succinctly capture her spirit and her anguish. The video is great! Her genius was transforming agony of body and spirit into art. Unrequieted Love. How sad. But the gift it produced is unforgettable, and will be enjoyed by millions! Frieda is not to be missed. From my first sighting of a glossy book containing her work, I became her fan. Why? The colors, the passion, self revelation portrayed indelibly in her portraits. and then learning of her life. Frieda is a piece of work. The Frog? Well, life is full of the good and the bad – triumph and failure, joy and pain. Frieda drank heavily of all. Love it. Kirby, you did a wonderful job of conveying both the emotion and the motivation which “drove” her passion for art. From the tragedies in her life was born her genius and the need to visually express her pain. So appreciate your investment of time to develop and to share her story. The surrealistic aspect of her work challenges me. I am filled with empathy for the suffering of this woman which she shares, reveals so fully. She takes us to a place of honest personal examination, perhaps a place we would not otherwise visit. Thank you for setting this video with the background your winderful blog always provides. Having just finished reading a Kahlo biography by a friend of Sue’s whose first name is Gannitt, I found your blog most succinct and insight-full. Forty-seven is a brief number of years in which to shake the artistic “tree” as profoundly as Frida did. It is doubly surprising in light of the fact she had to slay her physical dragons, as well as her psychological ones (particularly faithless Diego!) in order to make her indelible mark. Thanks for another fine blog. How wonderful it is to journey into the video’s of artists that we love. It’s an amazing gift. Thank You. Frida Kahlo, Matisse, Mark Rothko etc. bring to any art lover a new awakening and a stirring of passion for brilliant artist and the works they create. Kirby! Thank you for choosing Frieda Kahlo as the figurative inspiration model for the Market Street Studio Gallery. Reading some background material about this angel of a woman who fought so hard to “live” and create within the confines of physical and mental pain simply wrenches the heart. Having see her art in so many different venues and not understanding the life she came from, releases such admiration for a “slight” of a girl. The story of her life and art have created a legacy which opens the doors for so many young women facing similar realities. I will continue to paint her face and figure as homage to the strength and determination of this amazing young woman.